It wasn’t until I was six years old that church even came on my radar as a thing. My mom worked all the time in those days, and finally, after a last-resort divorce, she settled us into a different life of meager means and lavish love. It was in those days that we responded to an invitation to church from neighbors. A weary single mom and four eager children met the welcome care of a loving church. Our experience was small town Bible-Belt Baptist, and that set the foundation for my understanding of God. In fact, years later, when I signed up for a World Religions course as a college freshman, I thought it would be a survey course on Christianity. My first experience with Lent, for instance, was through a college friendship. One Wednesday long ago, I caught up with my best friend after she had disappeared from our usual daily routine. We met for lunch and she had this mysterious, ashen cross smudged on her forehead. I resisted the urge of just lovingly wiping it off for her, thinking she was unaware of it. Pointing it out instead, she taught me my first lessons on Lent – on repentance, fasting (sacrifice), the Cross and the Resurrection of Christ. All of that was gloriously real for me already, except for setting aside 40 days of resolve prior to the celebration of Easter. For years, I still didn’t take Lent very seriously and still don’t know quite how to (or if I should) incorporate it into my life…except that my thinking has changed. In this world gone mad, I am more convinced than ever that we as the Church need to stand together for the sake of the nations and for the glory of God. If in Lent, I can find elements that help me see God, and our corporate and personal need for Him, more clearly, then I want to integrate some measure of Lenten practice into my life. Month-long fasting (one part of Lent) has never been a draw for me, as I was always completely sure it would be a fail. While we lived in North Africa, and especially in Egypt, fasting was very much a part of our Muslim and Christian neighbors’ lives. Even those Christians who were evangelical (from Coptic backgrounds) saw the importance of fasting. Their awareness of the evil of sin in the world and the need for drastic measures lined up solidly with Jesus’ own life and teaching on this. As I write this, my penitent friend with the ash smeared on her forehead comes to mind again. Decades later, on this day, I’m sure, wherever she is, she has a new ashen cross applied. Reminding her of the sin in her own life that Christ paid for Himself with His death on the Cross. Many may see Lent as extra-Biblical and therefore unnecessary to add to our countdown to commemorating the crucifixion and resurrection of Jesus Christ. For me, at least, it gives a bit narrower road to walk for forty days – examining our own frailty, our sin, and the brevity of life alongside the magnificent perfection of the life and love of a wholly surrendered Christ. Bible Gateway extends a free invitation to receive devotionals daily until Lent from A 40 Day Journey with Dietrich Bonhoeffer. I’ll be going through that as part of my reading these 40 days until Easter. Also for the past several years, during Lent, I have read Adrian Plass’ book The Unlocking – God’s Escape Plan for Frightened People. It was a gift from a good friend during our years living overseas. There’s a lot in this world that’s frightening these days. Yet God is still God and is at work in the midst of so much crazy. I believe Him at His word. Full stop. We have a role in dealing with what we see in the world. As Jesus told His disciples (Matthew 17:21), there is evil that we can only battle with prayer and fasting. This is a power unleashed in a true observance of Lent. For these forty-plus days before Easter, I will be reading A 40 Day Journey with Dietrich Bonhoeffer; referring back to the book-marked portions of The Unlocking; reflecting on God and the goodness and wisdom He displays through Jesus’ life and teaching; resisting (fasting from) those money- and time-stealers that distract me from larger issues; repenting of the sins of neglect and indifference; and remembering to pray and reach out to God and those around me as His vessel for His purposes among the nations. As I write this morning, it is quiet outside. Very quiet. Lonely quiet. This is the morning of exhausted grief. Jesus, the Messiah, God’s Sent One; His Only One lay dead in a tomb. Dead. How is this possible? The disciples, his family…those followers whose lives were transformed must have been numb with the stark reality that he was not with them…not on that Saturday. What would they do without him? What would happen to them? What? What? What? For the Jews, days begin and end at sundown. Most probably this visit with Pilate occurred Friday night. At his command, guards were placed. The tomb was sealed. Jesus would be no more trouble…. “He is dead: this man from Nazareth, the Messiah of Israel, the Lord of the world. Read the rest of his poem here. We today have the great knowledge of the risen Christ, but his followers, on that Saturday, only had dim recollection of his words of promise. Shrouded in grief, they found themselves quite “in between” – in between the death of their Savior and the life of his glorious promises. A dear friend of ours, Beth Wayland, shared with us this message by John Ortberg (quote above and passage below) from a conference where he spoke on Black Saturday, well, “Saturdays” in general. He describes so well this day in between. “Saturday – the day between the crucifixion and the resurrection. What do you think the disciples were doing on Saturday? Here they have seen their friend and their Master killed the day before but also have this vague promise, which probably seemed ludicrous at the time that he would rise again. So what do you think they were doing on Saturday between the tragedy and the promise? Question: What is Holy Saturday? Probably the greatest offense of Christ to a disbelieving world is the cross. Why? Surely, the God of the universe could have orchestrated another way…a gentler, more palatable way to reconcile a wayward people back to Himself. How can we, mere mortals, prescribe to Creator God, a better way? God have mercy. In our small understanding of the costly nature of sin and the priceless redemption available to us through Jesus, we are undone. A sinless savior. Paying our debt that we had no way to do it. To a holy God. God the Father, restoring us back to Himself, through the death of this precious One, Jesus. Songwriter Rita Springer wrote a song entitled This Blood that exquisitely describes what Jesus did for us. There is something about this song that also brings together generations. Don’t miss how Springer describes the inspiration of this song and her personal experience of God in the process (here). She also talks about her heritage of parents and grandparents who loved God deeply and raised her up in the tradition of choirs singing of this great love. YouTube Video – Rita Springer – This Blood Song Story – listen to Springer’s testimony of how God gave her this song and how it resonated for her with the generations before – the hymn-singing generations – her parents and grandparents who loved God so. A group of us were talking about camp songs tonight, and I actually couldn’t keep my mind off of singer/songwriter Josh Wilson‘s Christmas song Jesus Is Alive. It’s getting major radio play this year. I thought it was a new song, and then the Facebook memories function popped up a memory of five years ago. My friend Alicia had pointed this song to me as her new favorite…five years ago. What makes this song remind me of beloved camp songs of old is that its lyrics, and the way Josh sings it, is like telling a story around a campfire. I can just see the fire, large before us, warming our faces, popping and crackling, brightening those in the circle and casting shadows beyond. Sparks flying up to the sky. Josh’s song celebrates that baby born for us, and his song also points us to a blessed redeemer, a risen Savior. As I write, there’s a little figure of the Christ child on my work desk. Wrapped in swaddling clothes as recorded in Scripture (Luke 2:7). Something about this figure reminds me of Jesus’ death also (John 19:40). Jesus, as an infant, was briefly swaddled before he grew up and became a man like no other. After the briefest of ministry, he died a horrific death…for us. Let that soak in again. His body would be wrapped in grave clothes but would not be bound by them. He rose to life again, right out of those burial cloths. Hallelujah, Jesus is alive! We have so much to pause and consider this Christmas season. Allow this simple song take you into the great scope of all Jesus did for us…and continues to do. Worship with me please as we tell this great story in sweet song. Let’s warm ourselves by the shepherds’ fire. Let’s walk with the Savior as he teaches about the Kingdom of God. 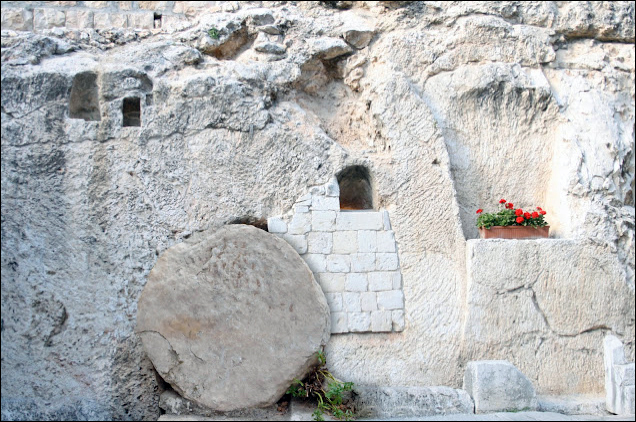 Let’s run into the tomb to find it gloriously empty. Jesus Is Alive!!! ‘Cause Jesus is alive. Yea Jesus is alive. This week coming up is not like any other in the calendar. Through the centuries, this week has been considered holy. We note each day as significant because of what happened for the sake of all humanity in the space of 8 days…8 days that changed history forever. Many writers commemorate Holy Week. I wrote a series of articles myself (links are below). Desiring God also has a great series on Holy Week…and Mike Mobley’s Events of the Holy Week. Then there’s Tom Elliff’s beautiful piece on The Easter I’ll Never Forget. You can find much to read on these incredible days of Jesus’ life. In all the busyness of this month, with school assignments, work deadlines, and Spring vacations, don’t miss Holy Week. Don’t miss Jesus of Nazareth…whose life is set in history and who sets us into His Story.